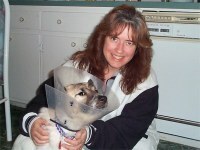 DELTA WAS ADOPTED APRIL 4, 2003! Delta weighs 30 pounds and is about 1 - 1 1/2 years old. She had lived in a home with her brother, her UNNEUTERED brother. And guess what? Delta had a litter of puppies. Does this surprise anyone? Amazingly, some people assume siblings cannot accomplish such a feat but yes, they can. So the solution was to surrender Delta and her brother to the shelter. Perhaps these people had never heard of spaying and neutering? 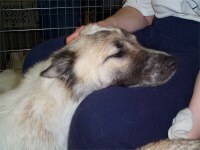 Delta's brother is being taken in by a Border Collie rescue group and Delta came into a foster home in our rescue group. She is an incredibly sweet dog. She is submissive to humans and craves a canine companion. She instantly made friends with the other dogs in the foster home and would need to go to a home as a companion to another dog or else she would be absolutely miserable. The shelter told us that she was happy there while she had a roommate but as soon as her friend was adopted and she was left alone in her run, she was unhappy. So this is definitely a dog for the multi-dog household! Delta is very responsive to humans and wants to please. Someone at the shelter had marked her cage tag "DO NOT PTS" (do not put to sleep) because she was so well liked. Our veterinarian also remarked on how nice of a dog she is. 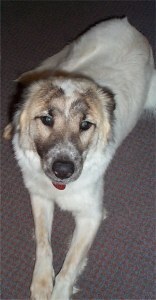 Delta will be spayed prior to adoption as to prevent any future "accidents".